Like many parrot parents, I was feeding all of my parrots a mix of Zupreem Natural Blend, Zupreem Fruit Blend, and Harrison's Natural. I've been feeding my birds this mix for quite some time (at the direction of our Avian Vet). While I find all of these pellets to be a great choice for your birds, I was particularly bothered by the Zupreem Fruit Blend containing artificial coloring. My birds love all of these pellets but I wanted to get away from feeding them a pellet that had any artificial ingredients. So, I started researching affordable alternatives. While I honestly have been drawn to Tops Outstanding Pellets, I find their prices far too expensive for me, as I have six varying size parrots to feed. Then I came across Higgin's All Natural InTune. I was amazed, not only were the prices comparable to what I was already paying for Zupreem, these Higgin's InTune pellets were not only completely natural, but they are also colored! Further investigation showed that they are colored by natural ingredients such as carrot juice, beet juice, herbs and spices! Why doesn't everyone do this?! 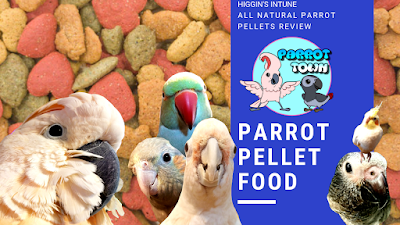 Another cool thing to mention here is that from what I've researched, out the 45 years Higgin's has been making parrot food, they have had ZERO recalls! Now, the question was, would only some of my birds take to them, would all of them like the Higgin's, or would these pellets be completely rejected across the board?! We all know, parrot food is not cheap! Even if you buy Zupreem! So, this was quite a financial risk in my book. But, it was far more important for me to try than to wonder. So I did! I have six parrots. Two Cockatoos, one Timneh African Grey, one Indian Ringneck, and two Cockatiels; and guess what?! 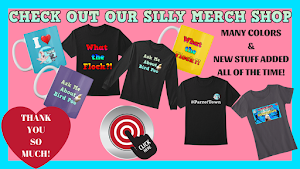 Every one of my birds LOVED them right out the gate! I couldn't believe it. I was so ready for someone in the flock to completely reject them, but no one did. So, in the end, my parrots and I can't say enough good things about these pellets (oh, and did I mention they smell Amazing?). I love these pellets so much, I had to do an episode of Parrot Talk about them (which, I've included below). Please note that I ran into audio issues in the beginning, so please feel free to fast forward to 2 minutes and 33 seconds. Thank You So Much for reading and watching! Leave me a comment below to let me know what sorts of pellets you feed your parrot or if you've tried Higgin's. I would Love to hear your thoughts!